How to retrieve lost data from hard drive? How to prevent hard drive data loss? This article includes step-by-step instructions to recover lost data from hard drive free. Data loss is a very common issue, as almost everyone faces the problem at some point of their lives. Successful hard drive recovery is important to everyone, as no one wants to lose important data. If you are experiencing data loss issue on hard drive, you are lucky, you can follow this guide to retrieve lost files and partitions easily and safely. It seems that data loss is unavoidable even though you've taken proper precautions to protect data. Files stored on hard drive may get deleted or formatted, and the storage device may get broken. Moreover, only few users are careful enough to back up files in time. Thus most of us will have to face data loss issue and learn how to recover them. The follow part explains common causes of data loss related to daily lives. Once you have this insight, you can learn how to prevent data loss and how to get back lost data from various devices. Files are deleted from devices that do not have a Recycle Bin, such as USB flash drive, SD card and Network. The deleted file is larger than the capacity the Recycle Bin can hold, and it will be deleted directly by passing Recycle Bin. Files or folders are deleted by keys Shift + Delete. Files are deleted from Recycle Bin or the Recycle Bin is emptied. Formatting process wipes everything on the partition or disk being formatted. People often format hard drive or partitions for a variety of reasons such as install system, change file system format or repartition a hard disk. Here are some situations you may perform disk formatting. Partition a hard drive. When you prepare a hard drive for storage purpose, you'll create partitions on that disk. The partitioning process formats the disk and deletes everything. Change file system format. There are various file system types you can use such as FAT32, exFAT, NTFS, EXT4, etc. Most of times, the only way to convert files system type is formatting the drive. Repair corrupt drive. It happens that your drive may turn to RAW or reports errors like "The parameter is incorrect". Some may suggest CHKDSK to repair the disk, but that cannot fix all such errors. The best solution is formatting corrupt disk. Install operating system. Installing system formats system partition and then writes system files. Disk is not formatted. The disk in drive H is not formatted. Do you want to format it now? Location is not available. G:\ is not accessible. The file or directory is corrupted and unreadable. Location is not available. J:\ is not accessible. The parameter is incorrect. New virus and malware keeps popping up to attack computers every day, putting your data at risk. Being connected to the Internet is not totally safe, as there are too many types of viruses to safely bypass their attack. The main target of virus is stealing, damaging and deleting business or personal data. For example the WannaCry Ransomware launched a worldwide cyberattack in May this year and numerous businesses and individuals suffered from data loss. To protect data from damage or loss caused by virus, you should install anti-virus software and create a proper backup. Hard drive is one of the most fragile parts of a computer, as it breaks down more often than other components. A hard drive contains too many moving mechanical parts, and it is very easy to get physical damages. Once a hard drive gets severe bad physical damages, you'll have to spend large amount of money to recover data from the hard drive. Let's see some cases of the physical failure of hard drive. Bad sectors. Hard disk bad sectors can be the natural dying or external damages. Hard drive containing bad sectors will become very slow, freeze computer or even cannot be recognized. Thus it is not possible to access data if there are too many bad sectors. Firmware corruption. Firmware is embedded in physical hard drive, which is responsible for hard drive operations such as manage interactions among other components. When started up, hard drive loads data from firmware area into RAM, then allowing the drive to report on readiness. If firmware fails, the drive might not be deleted by computer at all. Electronic failure. It usually refers to problem on controller board on hard drive. Any data on that hard drive will be inaccessible with the problem unfixed. Faulty heads. 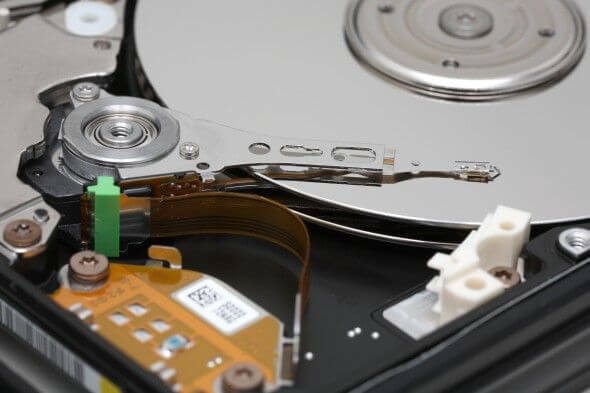 Hard drive heads works for read and write data and they can get damaged due to aging, impact or crash. Faulty heads may cause bad sectors, scratches platters, data loss, etc. In general, you can hear clicking or grinding noises once the hard drive is powered. Impact due to being dropped. Hard drive, especially external hard drive tends to suffer from impact such as being dropped. In most cases, the hard drive will be badly damaged. Sudden power failure. Power outages or power surge happens when you are writing a long article or the hard drive is transferring data, you'll lose the unsaved data and the hard disk may turn into inaccessible. Besides, sudden power failure also poses a risk to hard disk heads, causing bad sectors. Computer theft. It is really painful if computer is stolen or lost, as the danger exists that someone may steal sensitive files on your PC. Thus you may need to encrypt important data and keep multiple backup copies. Damaged due to spilled water or coffee. Electronic products do not like liquids, which is true of hard disks. If you spill liquid or dropping hard disk into water, you run the risk of losing all data on that disk. Disasters. Disasters like flood, fire or explosion rarely happens, but it is able to completely destroy both hard drive and computer. Thus many experts recommend remote backup and cloud backup. Hard drive recovery is possible when hard drive fails and many times hard drive recovery software is able to recover data. But you should protect both hard drive and lost data from further damage or data overwrite. Below are some recommended strategies you should know when you experience hard drive data loss problem. If lost files were stored on system partition such as desktop, you should shut down computer, unplug the hard drive and connect it to another PC. Do not try to reboot from this hard disk if you want to perform data recovery. If there is not extra computer, you should retrieve data from the hard drive in Pre-OS environment. If the failed hard disk does not contain important data, you can try CHKDSK to repair disk errors or perform a system restore. If the disk is no longer repairable, you can replace it with a new one. Do not save any new data or install applications to the hard drive where you want to retrieve data, as those actions are likely to overwrite lost files. If the disk failure is caused by corrupt files system, never format the disk even though Windows prompts to format. Apart from that, do not try disk check either. Both formatting and CHKDSK may lead to unsatisfied recovery result. Do not try to repair bad sectors by using disk check or bad sector repair software on a failed hard disk. Repairing bad sectors will cause permanent data loss. You can use professional disk image software to image the hard disk to a healthy drive, and the image process can be set to skip bad sectors. Never open the disk case by yourself. Professional data recovery center is able to recover data from broken disk by opening it and reading data from platters. But this should be done by professionals in a dust-free environment. If you open it by yourself, data on the disk will be destroyed permanently. If you want to recover data from hard drive on your own, you should choose a proper recovery program which should be reliable, easy-to-use and efficient. If you are new to hard drive data recovery, read the user guide or contact technical support for help. If your hard drive gets badly damages, for example, it cannot be recognized by computer, makes noises or freezes computer, data cannot be recovered by any software and it should be send to a data recovery company. It is said that the best way to defense against data loss is a rea-time backup, and yet sometimes data loss just happens before you are able to get files backed up. In that case you shall perform data recovery with a recovery tool. The way to recover unexpectedly lost data from hard drive should be properly prepared, and the recovery tool should be chosen in advance. There are loads of data recovery programs on the Internet and the market is quite competitive. Some software is free of charge, some has a trail version and some is paid commercial product. Which one is the best hard drive recovery software? We've cherry-picked two hard drive recovery programs you can use to recover lost data. Multiple recovery modes to guarantee it is able to deal will various data loss issues. Partition recovery is available. It is able to search for lost or deleted partitions and restore partition table directly. Support a variety of devices such as hard drive, external HDD, USB flash drive, SD card, etc. Both full scan and advanced deep scan are provided. Supported file system type: NTFS, FAT12, FAT16, FAT32 and exFAT. File recovery: Select the desired disk or partition and click "File Recovery" button on the toolbar; then you can select whether to recover deleted files or perform a complete recovery which works on formatted or RAW drives. Partition recovery: It is able to search for partitions which have been deleted or lost. Once lost partitions have been found, you can save them to current partition table. Virtual disk recovery: File recovery and partition recovery also works on virtual disks. You can load virtual disks or launch the application in a Virtual machine. Image & clone hard drive: You can image or clone a hard drive, and then perform data recovery from the destination leaving the original disk untouched. Hex editor: Advanced users can analyze hexadecimal data on hard disk and then recover lost data. Supported file systems: NTFS, FAT12, FAT16, FAT32, exFAT, EXT2, EXT3 and EXT4. The first thing you should do is checking Recycle Bin on your PC if you just accidentally deleted data from hard drive. When a file is deleted (select file and press Delete key, or right-click file to choose Delete option), it will be put into a special folder called Recycle Bin. The icon of Recycle Bin is placed on the desktop. It's very simple to restore deleted files from Recycle Bin. Step 1 Open Recycle Bin by double clicking it and find files you want to restore. Step 2 Select and right-click files you want to recover, and click "Restore" option from the menu. Step 3 Check restored files from their original location. If there is not Recycle Bin icon on your PC, you can add it in this way: Click Start button and select Settings; select Personalization -> Themes -> Desktop icon settings; then select the check box next to Recycle Bin and click Apply. Do not rely on Recycle Bin all the time to recover deleted files from hard disk, as it does not work all the time. For example, there are occasions that files are deleted by Shift + Delete or you've emptied the Recycle Bin. Files deleted from USB flash drive or memory cards are not put into Recycle Bin, thus this method cannot recover your data. Step 1 Connect the hard drive to another PC. To avoid data overwrite caused by operating system, you should connect the disk to another machine as a secondary drive. 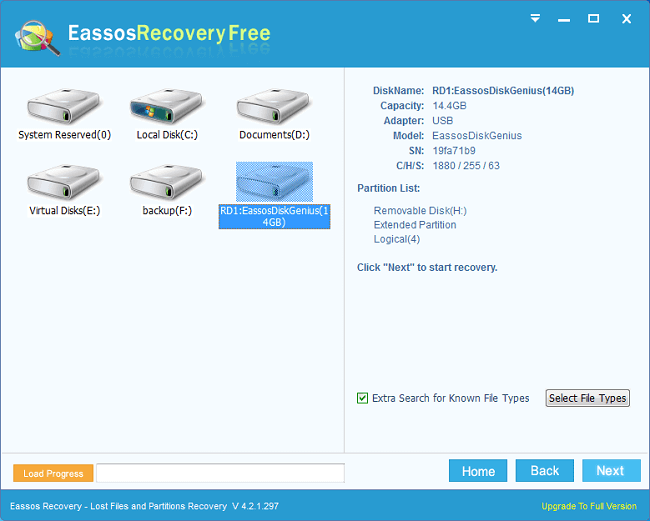 Step 2 Download, install and launch free hard drive recovery software - Eassos Recovery Free. Do NOT install the program to the hard drive which suffers from data loss issue. Step 3 Select a recovery mode on main interface of the recovery wizard based on data loss causes. For example, if you want to recover deleted files, then choose "Recover Deleted Files". Step 4 Choose a location to scan. Select the disk or partition where lost files were stored, and click Next to start full scanning. Step 5 Preview files. Click "Preview" next file name or double-click a file to preview it, which helps to check if the file is correct or damaged. Step 6 Recover lost data. While scanning pauses or stops, you can recover files to another disk or partition. Select the check box of files you want to recover and click "Recover" button. Then you can set a location to save recovered data. Video tutorial: How to recover lost data? It's not easy to recover data from a damaged hard drive, as recovery software won't work once the hard drive gets mechanical damages. For example, the damaged hard drive gets failed heads, and that should be the job of pros. The hard drive will need to be opened in a clean room environment in a lab so that pros can recover data via replacing damaged heads. Step 1 File Recovery. 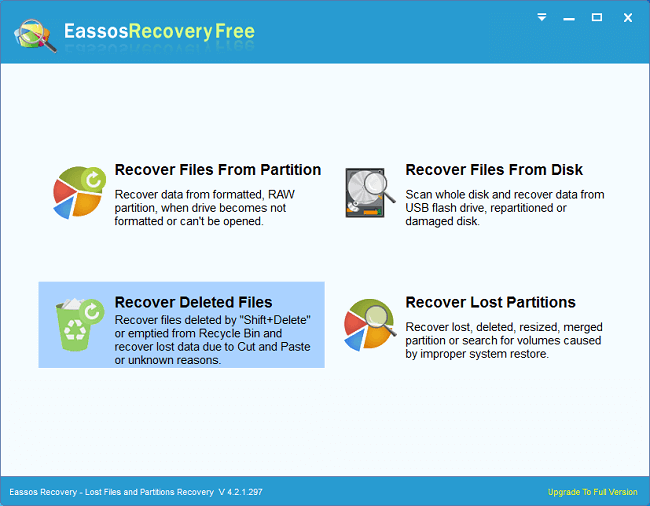 Launch Eassos PartitionGuru Pro, select the damaged disk and click "File Recovery". 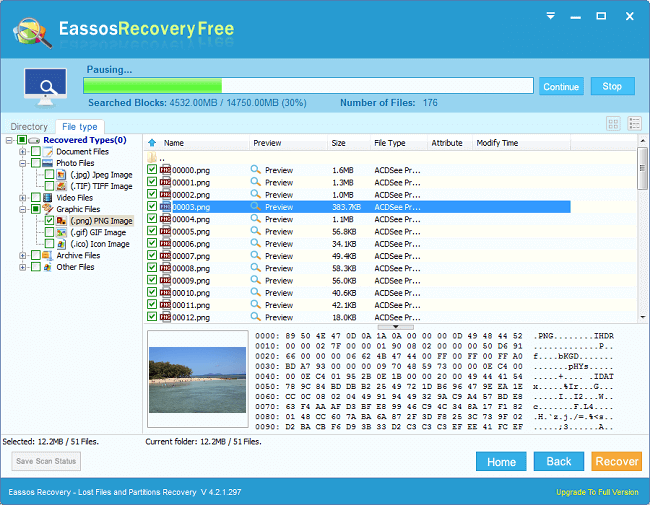 Perform a complete scan for the broken disk and check if your files can be found by this recovery software. If scanning process cannot proceed due to bad sectors, you can image the disk and then recover data from image file, go to Step 2. Step 2 Image hard drive. Click "Tools" menu and choose "Copy Sectors" to open disk image wizard. Select original disk and destination, and click "Copy" to start imaging damaged disk. Then you can use "File Recovery" to scan the image to recover lost data. Nobody wants to experience data loss problem, even though data recovery is already a very easy task. All of us should take preventive measures to ensure we won't become a victim of data loss. Here are some tips that may help. Back up data. You should keep at least one copy of the original data and put the backup on a different disk. Develop good working habits, such as do not save important files on system partition, click "Safely remove the hardware" before remove an external disk, handle hard drive gently, etc. Install anti-virus software. Some virus infections can encrypt data, delete files, damage partition, etc. Anti-virus software should be installed and enabled to provide real-time protection. Add UPS for your desktop and servers. A sudden power failure causes all kinds of problem, you can add an UPS so that you have ample time to save files, close programs and shut down computer when power surges. Hard drive data recovery is possible as long as lost files haven't been overwritten and users can recover data from hard drive, external hard drive, flash drive, virtual hard disk, etc. with the help of hard drive recovery software or professionals. If you have other solutions or questions on HDD recovery, please feel free to share or contact our support team. "Thank you for the thorough and complete, well presented, easy to follow and understand information that left me asking no questions. Well done." "hard drive recovery is a very important tool and it can be needed any time on urgent basis. Thanks for this informative post. Well explained with graphical presentation. "